Two vector knights battle each other in an overhead death pit. 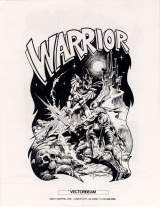 Released in October 1979, Warrior was the first one-on-one fighting game. 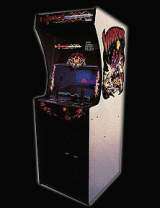 Back in the 1970s, a few arcade distributors still held on to the exclusivity rules that were a holdover from the older pinball days. Because of this, many arcade game manufacturers had several different names. Atari was also 'Kee' and 'Horror Games'. While 'Sega' was also known as 'Gremlin'. Many people think that Vectorbeam and Cinematronics were the same way. But that wasn't how it really worked with them. Vectorbeam was originally an independent company. They had purchased several titles from Cinematronics in the past, but were a totally different company. But in 1978 Cinematronics bought Vectorbeam so they could have their patents. They promptly released Warrior under the Vectorbeam name, and then shut the company down soon after. It was a very rare game. There was only one way to buy this game, and that was in a dedicated cabinet, and only upright versions were available (and this was one heavy game, weighing in at 280 lbs). This particular title had white sides with sticker style sideart of two Knights crossing swords while a sinister castle loomed above them. The marquee, monitor bezel, and control panel all had graphics of swords and energy beams. There were two joysticks on the control panel, and they were of a very sturdy design, and were probably the only thing on a Warrior machine that wasn't bound to fail in a few years. 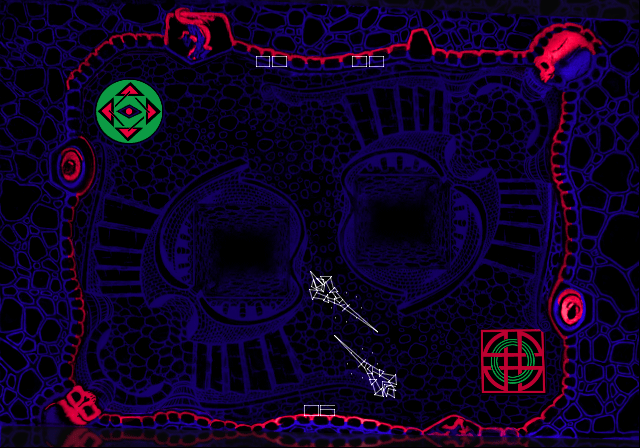 The game used a rather complicated display system that included a 19'' black and white vector monitor, a half-silvered mirror, and a detailed plastic display of the game background. Those items all came together to make it look like the action was happening directly on the picture of the background, instead of on the monitor itself.